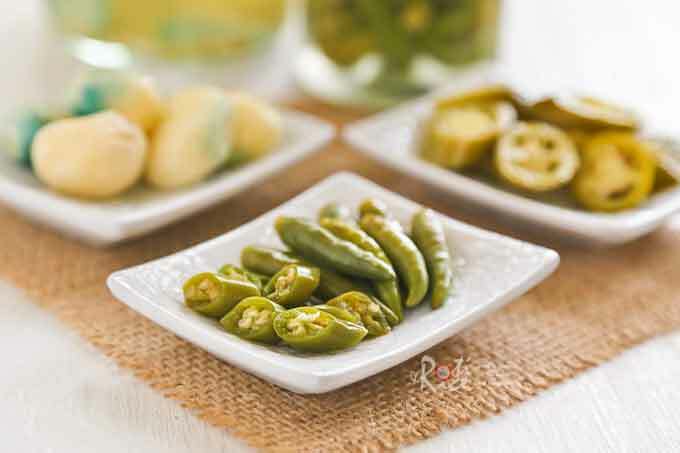 Pickled Green Chilies are a spicy condiment often served with stirred or fried noodles in Malaysia and Singapore. They are a must-have with stirred wonton noodles, Kuala Lumpur style Hokkien fried noodles, and Cantonese Style Fried noodles. I like it even with soupy noodles and usually have a small jar in the refrigerator almost year round. 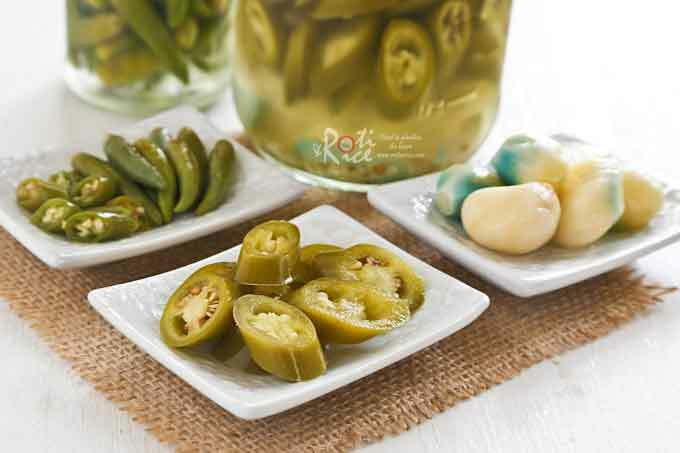 When properly preserved, Pickled Green Chilies do last a long time. Mine never last that long. They are usually gone within a month or two. Whole pickled bird’s eye chilies last longer as they are not cut and are more sturdy. These spicy chilies are great pickled as they do mellow out in the vinegar. Sometimes I throw in a few cloves of garlic or shallots to help flavor the vinegar. Garlic and shallots loose some of their pungency when pickled. They are quite tasty after hanging out in the vinegar solution for a few days. I usually consume them within 2 weeks when they still have a little “bite” and crunch left in them. There are all kinds of vinegars out there. The ones commonly found here are white distilled vinegar and apple cider vinegar both at the recommended 5% acidity for pickling. I have always used rice vinegar in cooking and pickling as that is what my Mom and a lot of others use in Malaysia. A closer check on the rice vinegars found here show that they vary between 4.2% to 4.5% acidity. I have used them with no adverse effects but please do read both these articles on making pickles and food acidity and processing methods by the University of Minnesota for ensuring safe canned foods. 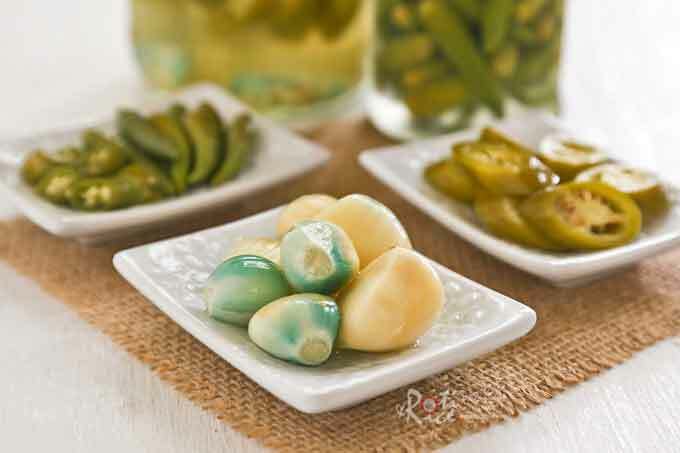 You have probably noticed that some of my pickled garlic cloves have a blue tinge to them. I recently read that this can happen using white distilled vinegar, type of salt, and immature garlic. According to this Safe Methods to Store, Preserve, and Enjoy Garlic article, garlic contains anthocyanins, water-soluble pigments that can turn blue or purple under acidic conditions. I have never had this experience using rice vinegar and I was eager to test it out. I had no idea if the garlic I used were immature but I did use white distilled vinegar with 5% acidity and regular store bought sea salt with no iodine. After just several hours in the vinegar, some of the garlic cloves actually started turning blue! Slice Serrano chilies at a diagonal about 3/16th (5mm) thick. Place in a colander and give it a good shake to remove as much of the seeds as possible. Peel garlic. Discard blemished cloves. Wash and pat dry with paper towels. Leave bird’s eye chilies whole. Sterilize 2 jars sufficient to hold all the chilies and garlic. I like to throw in the lids for just 3 to 5 minutes towards the end. 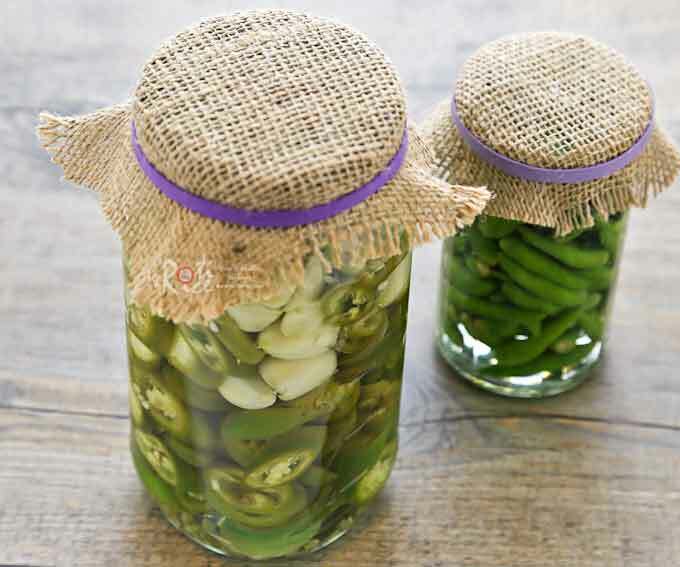 Place sliced Serrano chilies and peeled garlic in one hot jar and bird’s eye chilies in another jar. Combine vinegar, sugar, and salt in a small saucepan. Place on the stove and bring it to a boil. Stir to dissolve sugar and salt. Pour hot liquid into jars to cover chilies and garlic. 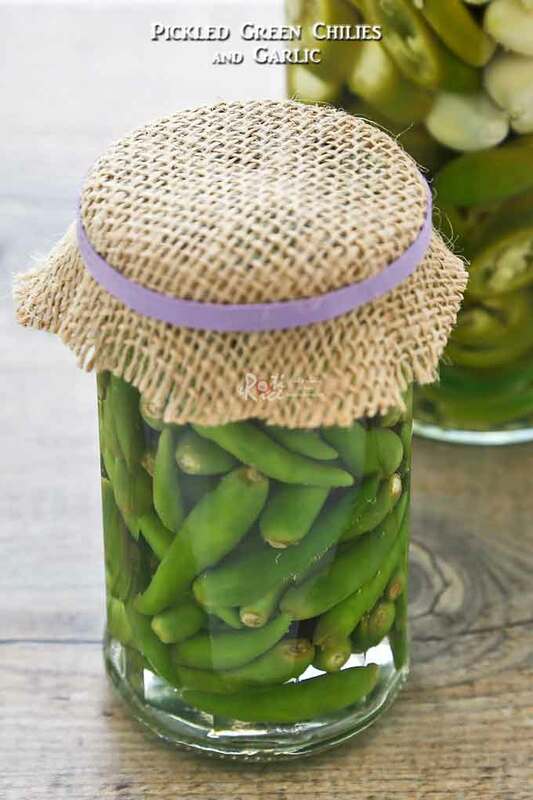 Place lids on jars and allow them to cool on the counter. When cooled, transfer to the refrigerator. Leave sliced Serrano chilies and garlic to pickle for 3 days and bird’s eye chilies for at least a week before serving. 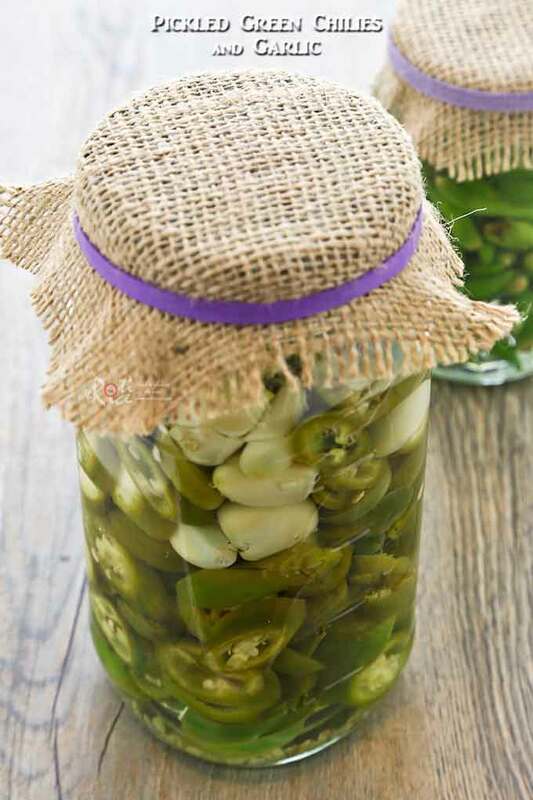 Consume pickled Serranos and garlic within a month and pickled bird’s eye chilies within 2 months. I think this is the year of the pickled pepper. 🙂 I’ve seen a lot of recipes this year and they are all different in some little or big way. I love the addition of the garlic and just a touch of sugar. Great recipe Biren! They look so good! Next week, if there are still some chilies on my plant in Minnie I will try making them! Pickled chilies are the best when eaten with egg noodles 🙂 Got to remember to make some for future noodles consumption, haha. Thanks for sharing. Looks lovely, I have one question, why does the chillies have to have warm water poured over them before putting in the jar. You must be mistaken. The hot water step is to sterilize the jars and not used to pour over the chilies.